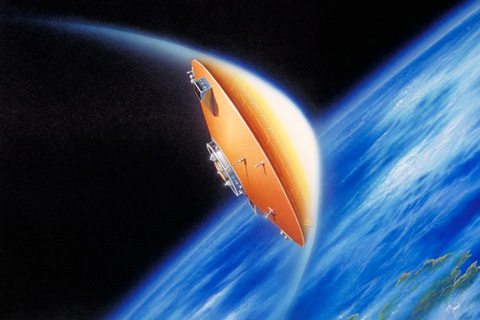 The Orbital Re-entry Experiment (OREX) flight experiment is part of the research for the H-II Orbiting Plane (HOPE). Its purposes are to contribute to HOPE development by accumulating experience in designing and producing a re-entry vehicle and acquiring re-entry data which is difficult to acquire in ground experiments. The OREX vehicle was launched and inserted into orbit by H-II rocket in February 1994. It was then re-enter the atmosphere after one revolution. The vehicle was collected experimental data during re-entry, transmitted after re-entry, and splashed down in the Central Pacific Ocean. The OREX vehicle has a blunt-cone shape. The front of the vehicle, which is subjected to aerodynamic heating du-ring re-entry,is constructed of carbon/carbon material and ceramic tiles. These heat-resistant and thermal protective materials are planned to be used in HOPE. Temperature sensors and pressure sensors are installed in the vehicle.